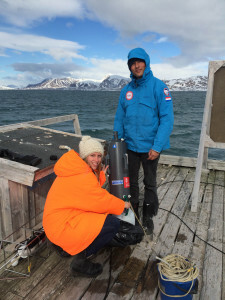 Willem van de Poll and Gemma Kulk sind zwei Wissenschaflter der University of Groningen, die dieses Jahr den gesamten Juni in Ny-Ålesund an der AWIPEV Station verbringen und sich mit Phytoplankton im Kongsfjord beschäftigen. Was Willem und Gemma aber genau untersuchen, könnt ihr in ihrem englischsprachigen Beitrag für unserem Arktis-Blog lesen. Viel Spass. For four and a half week we, Willem van de Poll and Gemma Kulk, from Ocean Ecosystems, University of Groningen (Netherlands) are in Ny-Ålesund to investigate phytoplankton in the Kongsfjord. Phytoplankton are the microscopic organisms that by their productivity provide the base of the entire marine food web, eventually feeding fish and large marine mammals. The declining ice cover in the Arctic may enlarge the growth season for these tiny organisms. How the changes will affect the phytoplankton species composition is largely unknown. With climate change and other climatic cycles affecting the conditions for phytoplankton growth, a large degree of variability can be expected. Investigating the changes in phytoplankton therefore requires a long them monitoring effort. The monitoring part of our project is running since October 2013, for which AWI technicians are collecting weekly phytoplankton samples from the old pier in Ny Alesund. Phytoplankton is collected on filters which are analyzed at home for the pigments that give information about phytoplankton biomass and composition. Monitoring the phytoplankton pigments will provide insight in year to year variability in phytoplankton composition and biomass. Combining this with the underwater observatory data (temperature, salinity) we hope to identify the causes of the long term variability in phytoplankton. 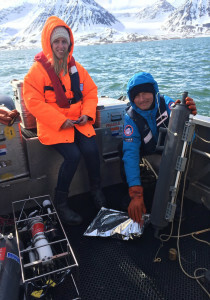 The current visit aims to supplement the monitoring data with more detailed observations of phytoplankton in the fresh water gradient in the Kongsfjord. In the fjord the fresh water comes from the glaciers and rivers. However the same process occurs in summer when sea ice melts in the Arctic Ocean. Due to the accessibility of the fjord we can study the influence of this important process on the phytoplankton in detail. We collect phytoplankton samples from two locations in the fjord, close to the glaciers and in the outer fjord. In addition, we run several experiments in the lab using the collected algae. We measure carbon incorporation under various light levels to estimate productivity of the algae. Furthermore, chlorophyll fluorescence measurements provide insight in phytoplankton photosynthesis and how this responds to light. On top of this we run nutrient addition experiments to investigate nutrient limitation. As the season progresses and the fresh water flux from land intensifies, the phytoplankton bloom may run out of nutrients. This transition marks the end of the Arctic spring bloom and influences the species composition and the food web. When all of this is done we enjoy the hospitality of the Blau Haus and Kingsbay and hope to see some of this beautiful location with 24 hours of sunlight. This project was funded by the Netherlands organization for scientific research. Falls ihr mehr über Willem, Gemma und Groningen Ocean Ecosystems erfahren wollt, dann schaut auf ihrer Facebook Seite vorbei. Willem und Gemma haben außerdem ein super Video über ihre Arbeit auf Ny-Ålesund gemacht. Das Vido findet ihr auf YouTube. Leider ist es von Deutschland aus nicht verfügbar.